Nostalgia is a Greek compound word that consists of the composites 'nostos', that means return and 'algos' that means pain.It is the pain caused by the unsatisfied longing of going back to something.This inspired the designer to make a ring, which is a piece of jewellery with intense sentimental meaning, that shows union at its base, but does not meet ends, facing up.The twist ending looking at different directions symbolizes that the two people, although united, might or might not meet again. 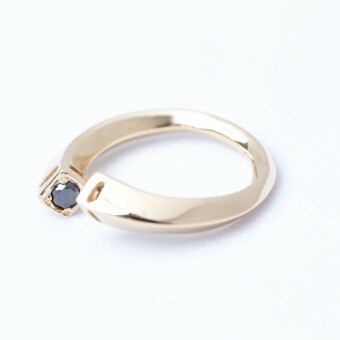 Nostalgia describes a ring,which does not close face up making a twist looking at different directions.It is designed to be made by 18K yellow gold and set with two black round brilliant cut diamonds. Its special rhombic section makes it gentle to be worn and its top twist rises visivility for the stones that are set inside. 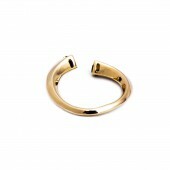 It is designed to be worn in any finger of the hand, both by men and women. The project began in January 2017 and was completed in February 2017. The project was first carved in wax to achieve maximum detail. It was then casted and the prototype was made into rubber in order to be available for mass production.It is made with 18K yellow gold and set with black diamonds. The ring is 6,33mmx28mmx28mm. Its width on the base is 2,86mm. The diameter of the stones is 3,92mm and their weight is 0.20ct each. 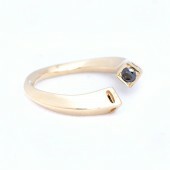 Rhombus, section, black, diamonds, ring, jewellery, gold. 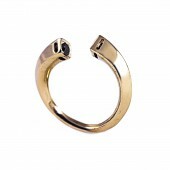 It was based in producing a ring with a geometrical section. The challenge was to produce a geometrical object. 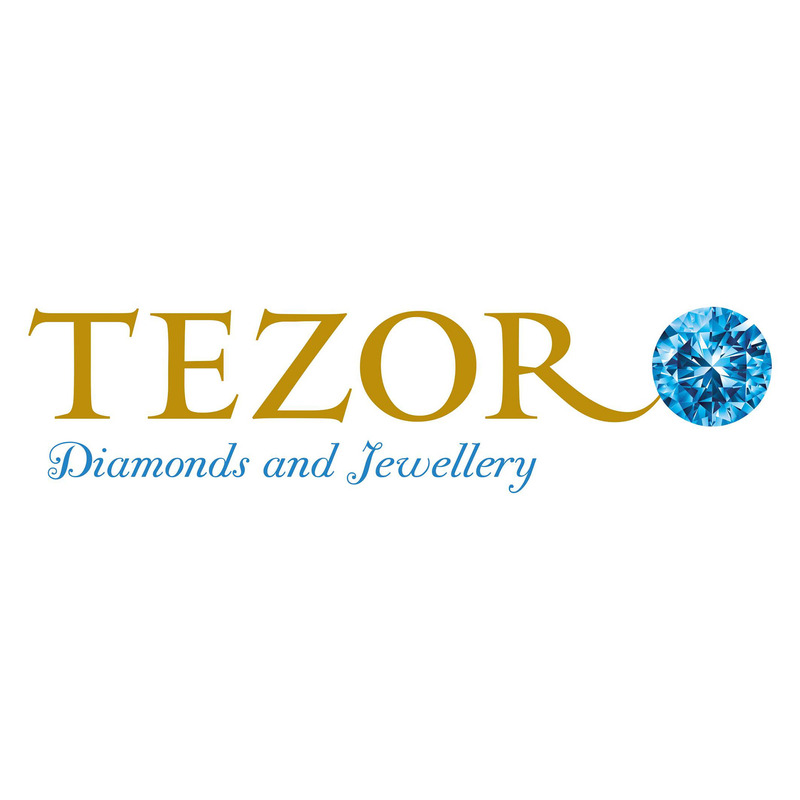 Tezoro was originally founded in 1922.It is a dynamic small business with an inimitable history.It continues the tradition in proudly representing Greek jewelry on an international level, a role TEZORO's owner and creative director Eleni Tezapsidou serves in multiple fronts as the President of Thessaloniki's Jewellery Association.With studies in jewellery design, handmade jewellery making, gemmology and business administration the family business presents collections in silver and gold with precious stones. 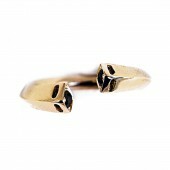 Nostalgia Ring by Eleni Tezapsidou is a Nominee in Jewelry, Eyewear and Watch Design Category. · Click here to register today inorder to be able to view the profile and other works by Eleni Tezapsidou when results are announced. Nostalgia Ring by Eleni Tezapsidou is Winner in Jewelry, Eyewear and Watch Design Category, 2016 - 2017. · Read the interview with designer Eleni Tezapsidou for design Nostalgia here. · Press Members: Login or Register to request an exclusive interview with Eleni Tezapsidou. · Click here to register inorder to view the profile and other works by Eleni Tezapsidou. Did you like Eleni Tezapsidou's Jewelry Design? Did you like Nostalgia Ring? Help us create a global awareness for good jewelry design worldwide. Show your support for Eleni Tezapsidou, the creator of great jewelry design by gifting them a nomination ticket so that we could promote more of their great jewelry designs.